Easter is coming along and I thought of creating some delicious two-bite recipes to share with you. These are recipes you can make ahead and freeze well, so you have one less thing to do for Sunday lunch. Both are vegan, free of gluten, refined sugars, and artificial ingredients. Basically full of plants, wholesome ingredients that will make you vibrate higher and feel deeply nourished. This is one of those times where family gatherings present us with a great opportunity to indulge in those yummy homemade classics. I’m all about eating intuitively and not stressing your body and mind about what you *can’t* eat or forbidden foods. Instead, try to include plant-rich foods on the table. 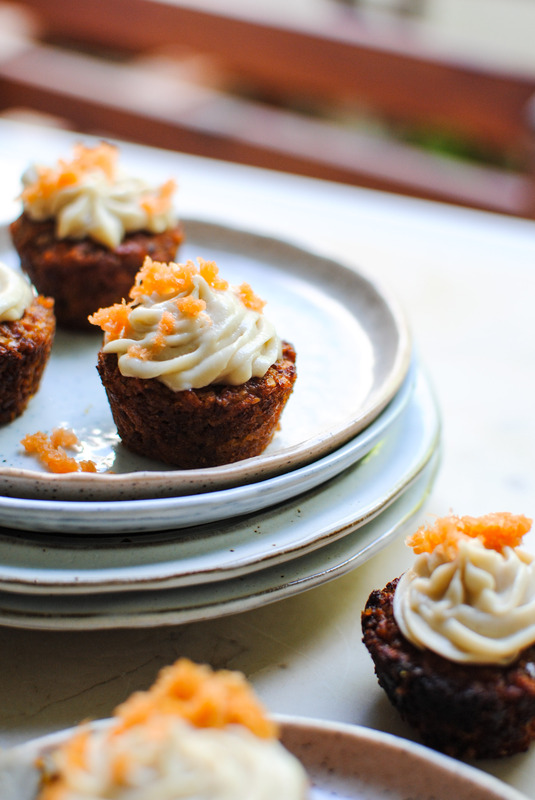 Take a delicious salad for Easter lunch, make a comforting soup for starters, a yummy dip with veggie sticks… Or bake these delicious carrot muffins! Having healthy options will make you feel lighter and will automatically make you want to eat less of the dishes that will make you feel heavier. This way you’ll have nourishing options you can delve into and motivate your family to try them too! 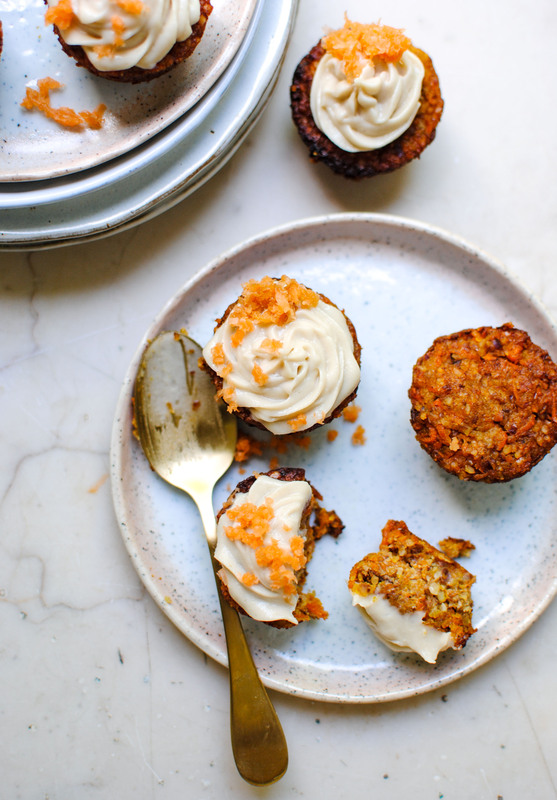 These carrot muffins are easily convertible into either big muffins (I’ve used mini muffin tins) or a proper cake; simply adjust the baking time and remove when a pierced knife comes out clean. Again, you can make the muffins ahead of time (they freeze well! ), make the frosting the day before, and assemble everything in a few minutes on the day of = less work for you! Feel free to add cinnamon, nutmeg, cloves or cardamom for deeper, warmer flavours. 1. Preheat the oven to 180ºc and cover your muffin tins with small circles of parchment paper or muffin molds. 2. In a good processor, blitz well the almonds until flour. Add the other dry ingredients, blitz again to combine and transfer to a large bowl. 3. Place the dates, milk, orange zest and juice, ginger and turmeric in the same food processor (no need to wash) and purée until smooth. 4. Add the date purée to the dry misture along with the grated carrots. Stir well to combine everything until a rough batter is formed. 5. Scoop the batter into the muffin tins and bake for 25-30 min or until a knife comes out clean. Let cool down before removing from the tins. 6. 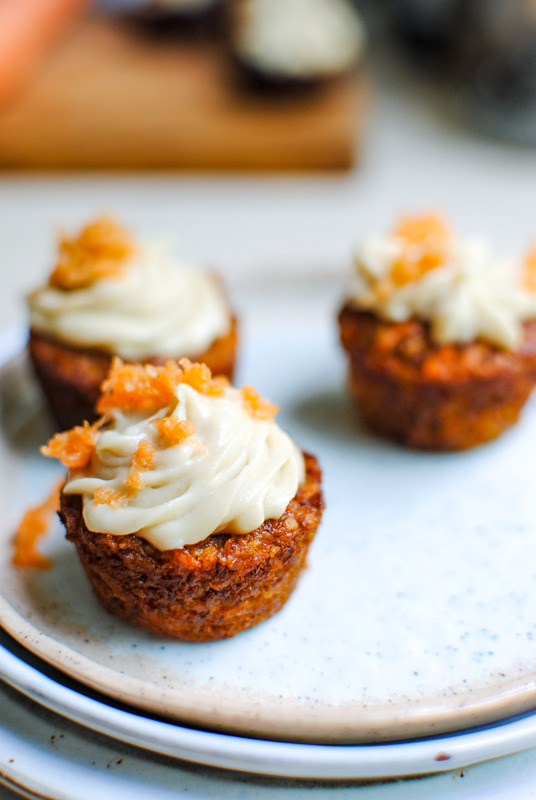 When cold, remove from tins and add the frosting to finish and some extra grated carrot to garnish. 2. Add all ingredients in a blender and blend very well until completely smooth (an immersion blender isn’t recommended). 3. Transfer the cream to a small bowl and keep in the fridge for a few hours to set. 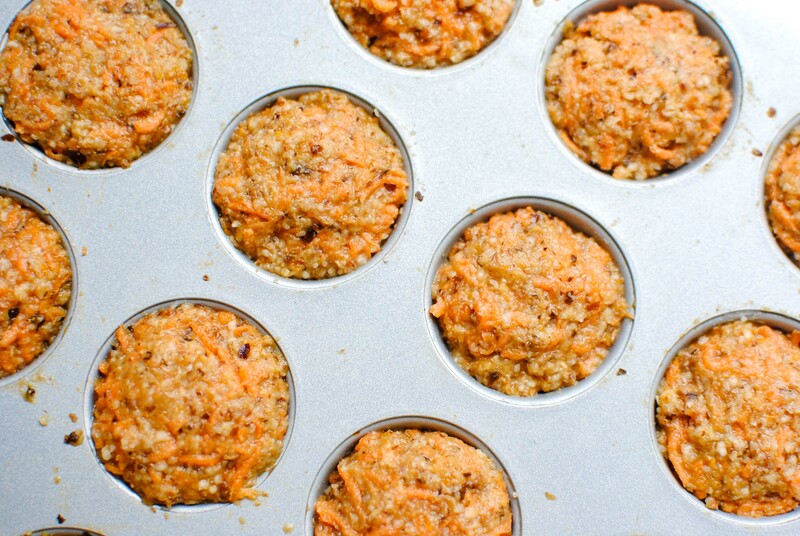 When it becomes hard, it’s ready to pipe or simply spread with the back of a spoon on your carrot muffins.